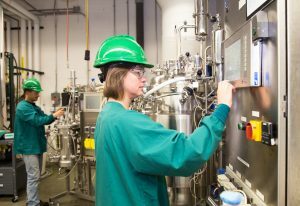 At MSU BI, we understand that scaling up any novel biobased technology or chemical process can present unique challenges. MSU BI’s flexible scale-up facilities (fermentation and chemical) and our experienced staff are dedicated to the rapid and efficient scale-up of your technologies. Our clients depend on us to help them progress from the lab to manufacturing scale, and our derisking process provides the degree of confidence required to take your technology to commercial scale. We can generate quantities of product for application testing and validation at either our fermentation or chemical facilities. Moreover, our team provides you with a complete data package, showing you precisely how your technology works at scale. MSU BI’s fermentation pilot plant eliminates the need for you to build your own. Here, our infrastructure and extraordinary team serve as your very own bioprocess scale-up facility. We collaborate with you, helping to design the best plan for your innovation’s scale-up—including biomass processing, fermentation, separation, as well as purification and recovery. Our three-level pilot facility is outfitted with modern equipment, instrumentation, and computer-based control systems. Our facility is plug-and-play: With a five-ton capacity ceiling crane, we can bring in necessary equipment to accelerate your technology. MSU BI Lansing has two 3,800L fermenters, along with a 150L and a 200L unit–as well as multiple 2-10L bench-scale units—used to diagnose scale-up effects. All process development and pilot plant fermenters have in-line mass spectrometer off-gas analysis and a complete suite of automated process control. 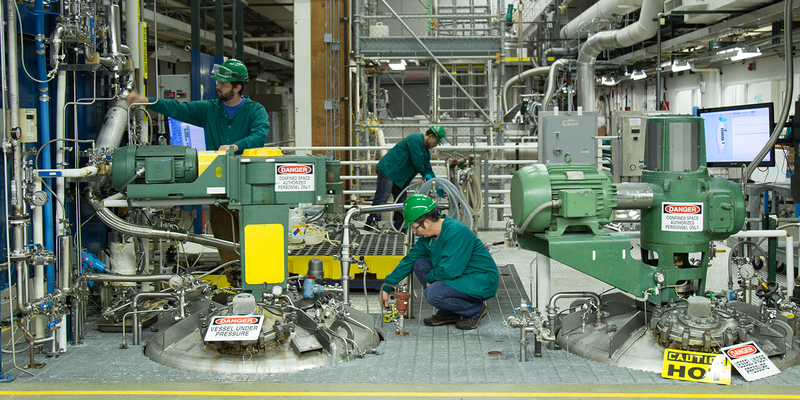 Our chemical facility, located in Holland, Michigan, is an ideal location to scale up your chemical technologies. Our team is experienced in performing chemical processes with both high standards for safety and for success. The facility is a former Pfizer Research and Development location and the team is comprised of engineers, chemists, chemical operators, and maintenance personnel that have extensive experience in the chemical processing industry. The team and the facility has produced a wide variety of specialty and agricultural chemicals. The facility maintains a Class 1, Division 1 Electrical Rating, is Process Safety Management (PSM) compliant, and has a flexible State of Michigan Air Permit. We can take your project from the lab to the plant in as little as four weeks.